According to the recent data, the “Housing Market Headed For “Broadest Slowdown In Years.” Fast forward to today, when we received the latest confirmation that the US housing market appears to have recently hit a downward inflection point: according to the just-released July 2018 U.S. Foreclosure Market Report released by ATTOM Data Solutions, foreclosure starts in July increased by 1% from a year ago — the first year-over-year increase following 36 consecutive months of decreases. 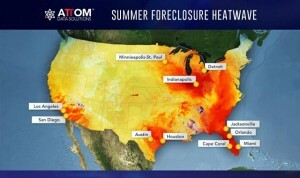 The increase in foreclosure starts is not just a one-month anomaly in many local markets given that July represented the third consecutive month with a year-over-year increase in 33 metro areas, including Los Angeles, Miami, Houston, Detroit, San Diego and Austin,” said Daren Blomquist, senior vice president with ATTOM Data Solutions. The data comes shortly after a separate report found that there has been a plunge of sales in an ultra-luxury real estate in New York City, where apartments that cost $5 million or more have seen their sale plunge more than 31% in the first 6 months of the year.